Riverfront Fort Wayne’s Promenade Park is bound to be a landmark on its own. 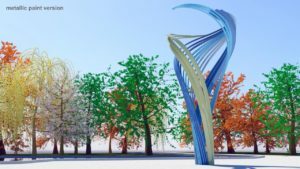 Fort Wayne Parks & Recreation, Arts United, Waterfield Foundation, and a selection committee made of art experts and community members are doing their part to elevate the park’s status to an even higher level. Check out the five artists and their diverse artistic styles below. Fort Wayne is a hub of multiple rivers that historically have brought trade, transportation, industry and development to this region. 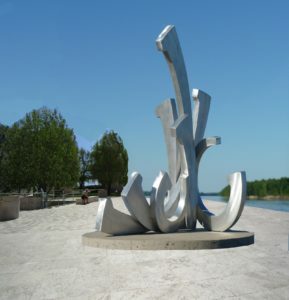 This metal sculpture, entitled “Flow,” not only carries the meaning of the artist’s last name but also will act as a gentle reminder of this rich history and the ever-changing nature of life around rivers. Formally, layered curves of the artwork depict the natural motion of water. Akin to the flow of water around solid objects -like rocks- in rivers and creeks, helix curves move around the inner void of the sculpture giving its final form. By having a small footprint this form also contributes to the ease of navigation around the heavy pedestrian traffic expected within the artwork area. 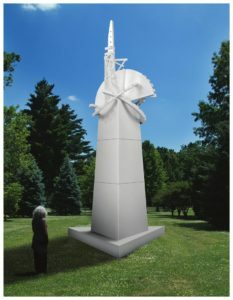 The finished sculpture will be approximately 19 feet tall and 12 feet in diameter. Osman Akan lives and works in Brooklyn, New York. Mr. Akan’s full portfolio may be viewed at http://www.osmanakan.com. 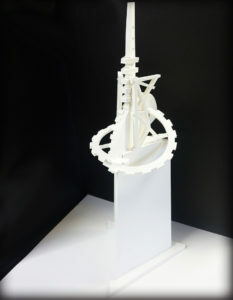 Mr. Dunbar’s sculpture submission, All Along the Watch Tower, is composed of three unique elements. 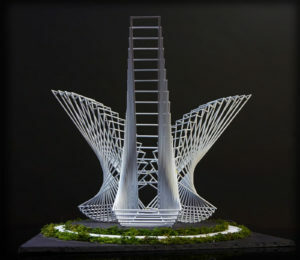 A three-sided tower base which makes reference to the three rivers that are so much a part of the cultural heritage of the City of Fort Wayne. 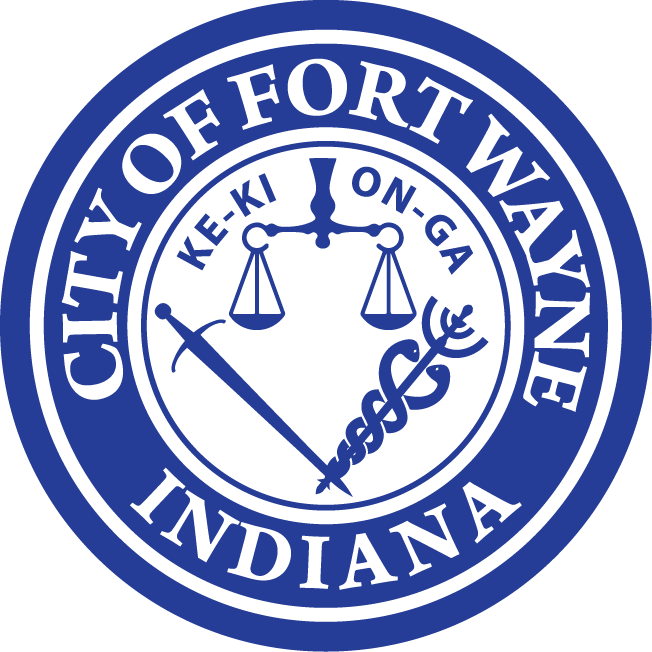 At the core of the design is a cog wheel that represents the machinery and industrial innovations that have been a significant impact on the economy of Fort Wayne. The spire of the tower is in reference to the unlimited future of telecommunication and is accented by two grid-like elements which reference the historic Wells and Harrison Streets bridges. The sculpture would weigh approximately 3 tons and stand approximately 19 feet tall by 10 feet wide and 10 feet deep. Michael A. Dunbar resides in Springfield, Illinois. Mr. Dunbar’s portfolio can be viewed at https://www.michaeldunbarsculpture.com. Convergence suggests the flow of the three rivers coming together, which has unified this region and the people. As one moves around the sculpture, one experiences a visual adventure, never seeing the same view twice. Light and shadows constantly change in the ambient light. 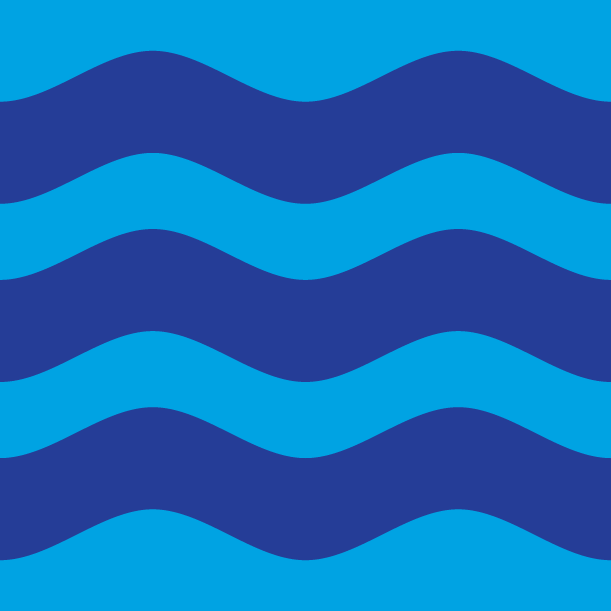 The form relates to the rhythm of the water, the heartbeat of the three rivers, a crossroad, and a powerful unifying force. The design creates a force of energy and momentum which is always moving forward. This art form is uplifting and leaves one with a sense of delight. 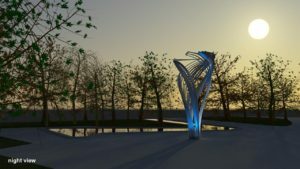 The sculpture, Convergence, creates a space for contemplation, introspection, solitude and peace. The completed sculpture will weight approximately 2,400 pounds and measure approximately 19 feet high, 28 feet wide, and 28 feet deep. Linda Howard lives and works in Bradenton, Florida. 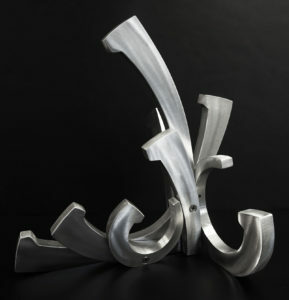 Ms. Howard’s portfolio can be viewed at http://www.lindahowardsculpture.com. An “Embrace” is to hold something closely with a sign of affection. From the most dramatic and predominant viewing angle, this sculpture suggests the open and inviting arms of the rivers as an embrace for all park visitors. With its out-reaching forms and dramatic movement, this monumental stainless-steel sculpture will draw people together and serve as a catalyst for conversations about community and togetherness. Just as the flowing waters of your rivers have enveloped and nourished the bodies, minds, and spirits of the greater Fort Wayne community, so too will the Embrace of this timeless piece of art. The finished sculpture will weigh approximately 3,800 pounds and measure 19 feet high, 18 feet wide and 14 feet deep. Nathan S. Pierce lives in Cape Girardeau, Missouri. More information on Mr. Pierce is available at http://www.nspsculpture.com. 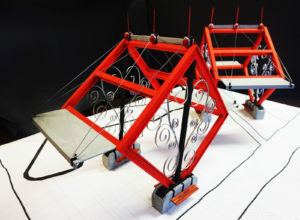 Bridges is based on the concept of utilizing the corner of Harrison and Superior Streets to create an interactive sculpture. Two 20 x 20-foot boxes turned on end and tilted two degrees invite the viewer to enter and pass thru the iconic forms invoking a sense of walking on a bridge to both enter and exit the Promenade Park. Seen from both inside and out, the angled shapes create moving shadows as the sun passes through. 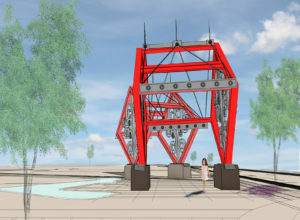 The two steel structures are a deconstruction of a steel bridge evocative of the historic Wells Street bridge and form a large triangle, bordering the new park, with the Wells and Harrison Street bridges. Large in scale, not to be dwarfed by trees nor the neighboring architecture, the architectural sculpture anchors the corner and will be seen from every direction and from many distances. Bridges will be used as a gathering place because of its size, location and the four awnings that protect people from weather. The angled cubes are also in harmony with the new pavilion buildings. They are both architectural and sculptural and give the viewer a sense of passing through the art as opposed to walking past a sculpture. This concept relies on the historical relevance of the river and steel bridges that make Fort Wayne a viable and successful city. 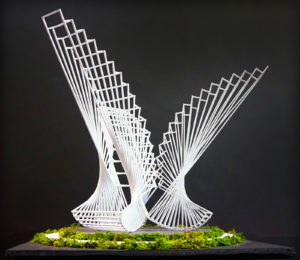 The sculpture will be recognizable for years to come and be an additional highlight to the skyline. Each of the two sculpture segments is approximately 35 feet tall, 20 feet wide and 42 feet deep. Cary Shafer resides in Fort Wayne. Mr. Shafer’s work may be viewed at http://caryshafer.com. Be sure to check out our Blog for updates on the sculptures! If you would like to learn more about the selection process, you can see the news release in the News section of our website. To download high resolution images of the artists’ renderings and models, click here.